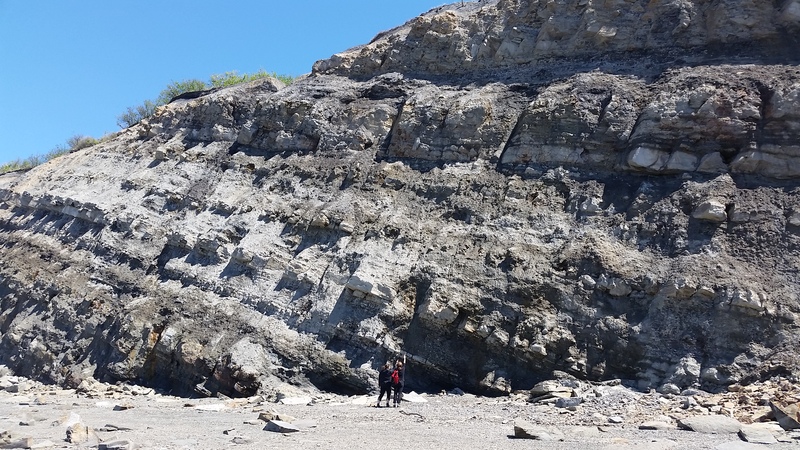 The sea cliffs at Joggins, Nova Scotia are a thing to behold – kilometers of gently inclined, layer-cake geology recording thousands of years of a Carboniferous coal swamp’s ebb and flow. 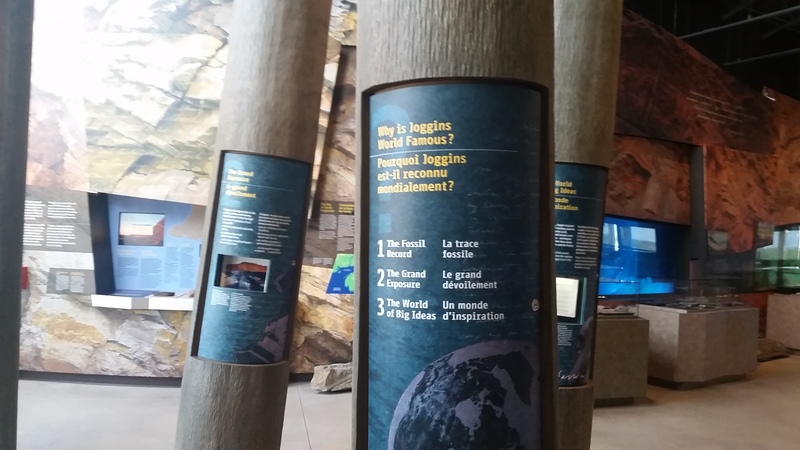 It’s a hugely important place scientifically and historically, as it influenced Lyell’s ideas about stratigraphy and geology, and Darwin’s ideas about evolution. 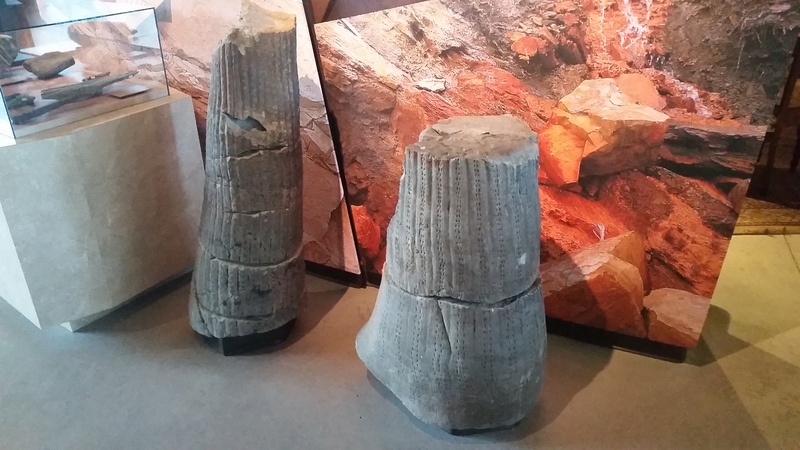 It’s often called the “Coal Age Galapagos” because its significance for understanding Carboniferous palaeoecology was akin to the Galapagos for Darwin’s work. It is a cool place to visit, and I got to join Hillary Maddin‘s team from Carleton for a few days earlier this June! In the photo above, Hillary is pointing out some of the lycopod trees that remain upright in the cliff. Follow her arm and you’ll see a great example at about 1:30 underneath the top shadowy layer. All told, we saw about 25 of these along the cliffs during our time there. 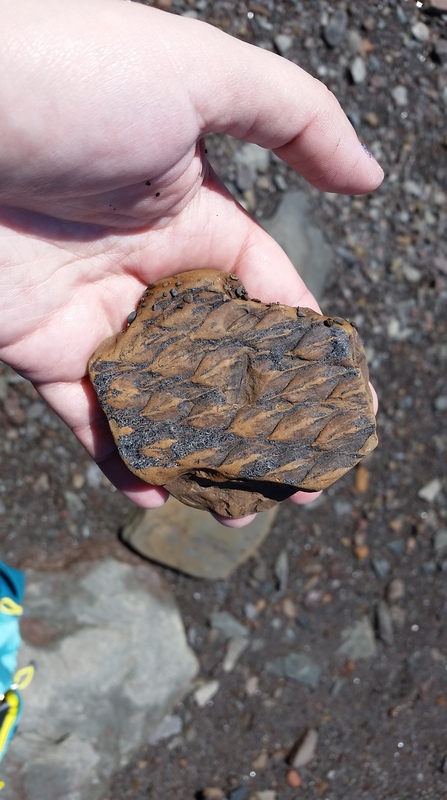 Plant fossils are INCREDIBLY abundant at Joggins – this is a small segment of ‘bark’ from Lepidodendron, one of the lycopod trees. You can’t take them home with you because this area is a UNESCO World Heritage Site, but you could spend many hours as a tourist happily poking around the rocks and finding cool stuff, as long as you leave it where you found it. More beautiful plants! Just everywhere!! The cliffs are fairly unstable and so it isn’t pleasant or safe to walk really close to them, since you can hear pieces coming down all the time. That, combined with some of the highest tides in the world (and a generally angry ocean, pictured here), make for a constantly-renewed intertidal zone that reveals new fossils every day. This is about 2 hours before high tide – once it’s in, there’s only a metre or two of beach in front of the cliff face. 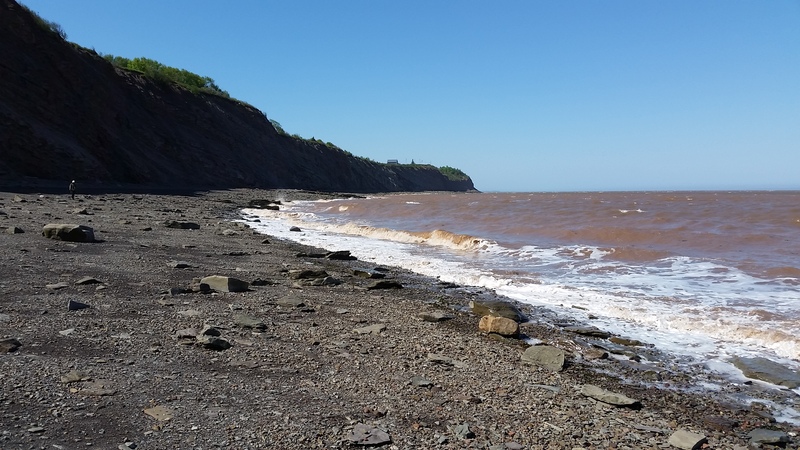 But when the tide goes out, it goes waaayyyyy out, and we’ve got lots of space to roam around and look for fossils. 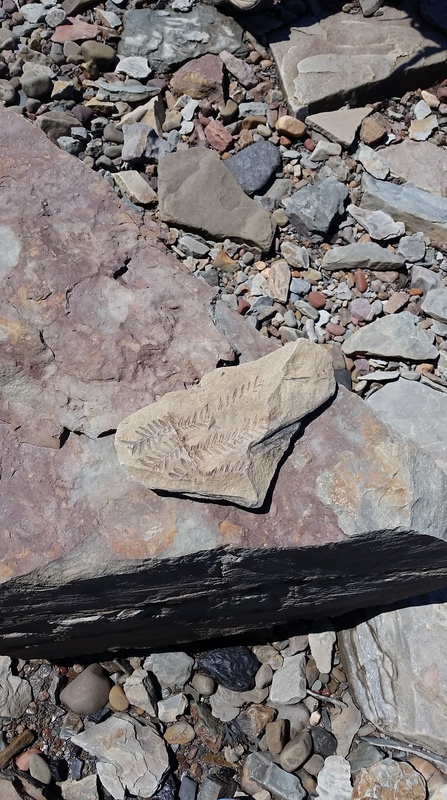 One interesting challenge at Joggins is just the sheer amount of visual noise to pick through while looking for fossils. Plants are easy to spot, but Hillary and her team are looking for more elusive vertebrate fossils, which show up in lots of different colours and lots of different host rocks – everything from black, coaly limestone, to grey sandstone, to smooth red ironstone nodules, to (and I swear, this is the best place to find them) inside the lycopod trees themselves. Yes, tucked away inside the likes of these already impressive lycopods are the remains of some of highly significant amphibians and tetrapods. 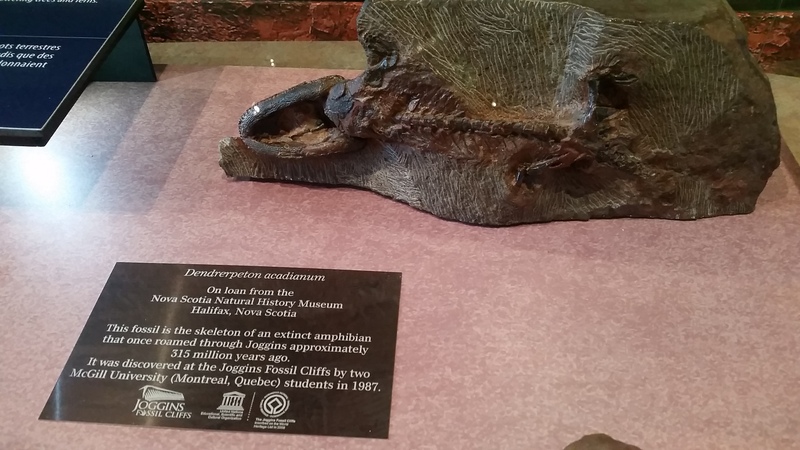 Most famous is the earliest reptile, Hylonomus, but also one of the earliest synapsids (the lineage that eventually leads to you and me), the outstandingly named Protoclepsydrops. One of the most beautiful fossils found at Joggins is this spectacular articulated skeleton of Dendrerpeton, a temnospondyl amphibian, about the size and shape of a blue-tongued skink. 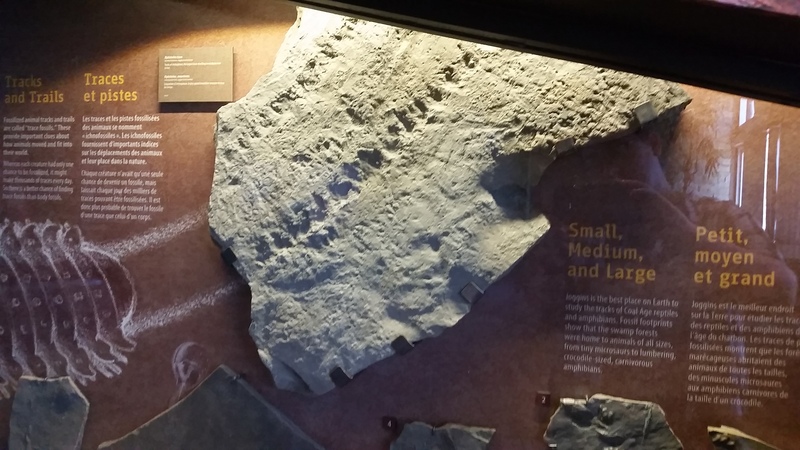 Tetrapod trackways are more common at Joggins and indicate that some sort of giant, more Eryops-sized beast called this area home, too. 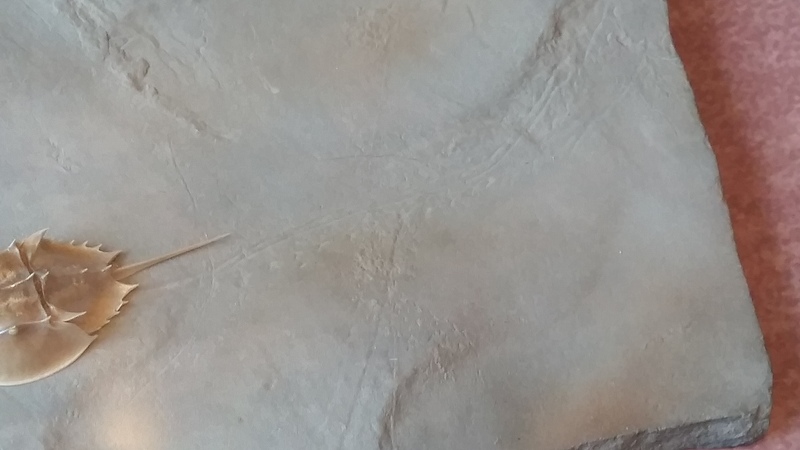 The tracks of tiny horseshoe crabs meet and merge into a single trackway – evidence of mating? The intimidatingly large tracks of the centipede-like Arthropleura are always impressive. 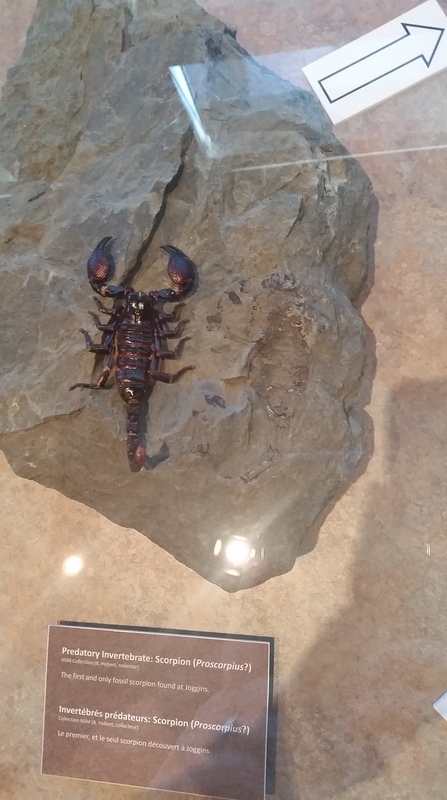 And finally, the incredibly rare fossil of a Coal Age scorpion – the mind boggles at how someone was able to pick this out of the visual noise on the beach. My kudos to them! 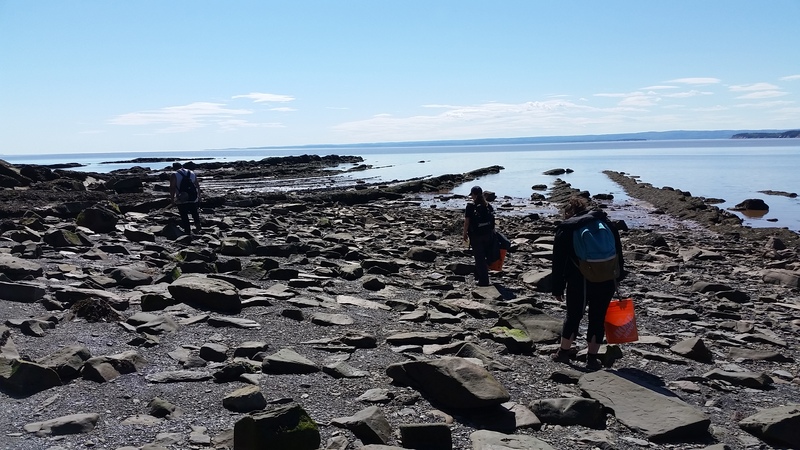 That’s all for now from Joggins – you can keep up with Hillary Maddin’s research on early tetrapods and amphibians on Twitter, and follow Joggins Fossil Cliffs for updates from the beach!